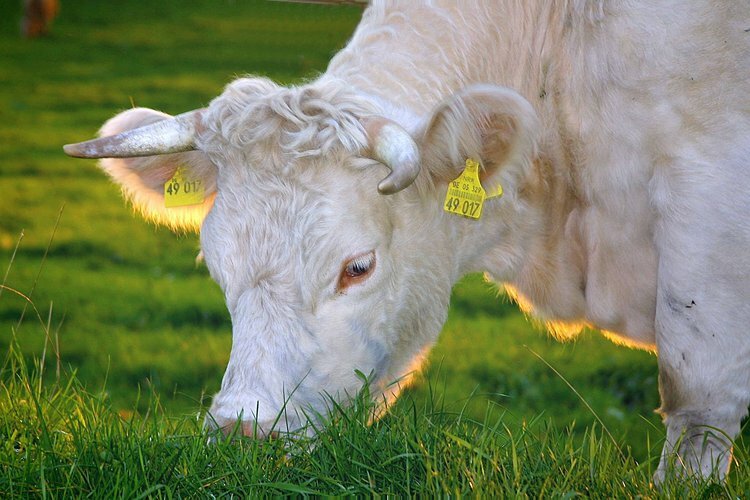 Is Grass-Fed Beef Healthier For You? In terms of beef nutrition, grass-fed beef has fewer calories than grain-fed beef because grass-fed cows have less total fat. Grass-fed beef may contain slightly less total saturated fat and monounsaturated fat than grain-fed beef, but much more omega-3 fatty acids and conjugated linoleic acid (CLA). Individuals around the world have increased their demand for meat. According to the U.S. Department of Agriculture, the average American ate more than 70 pounds of red meat (beef, veal, pork, and lamb) in 2012. Studies have shown that what we eat is not only important but also our food’s nutritional value. Whether cows are grass-fed or grain-fed, they start their lives out the same. The calves drink milk from their mothers and roam free in the fields eating grass, clovers, and shrubs. After approximately 6 to 12 months, the grain-fed cows are moved to feedlots while the grass-fed cows continue to roam. Grain-fed cows are usually fed with a base of soy or corn and are quickly fattened up in the large feedlots or Concentrated Animal Feeding Operations (CAFOs). In addition, grain-fed cows are usually given drugs and hormones to grow faster, as well as antibiotics to survive unsanitary living conditions. Do these living conditions affect the composition of the cow? A cow’s diet has a major effect on the nutrient selection of the beef. Grass-fed beef and grain-fed beef both contain many nutrients like vitamins B12, B3, and B6. They are also rich in bio-available iron, zinc, and selenium. Both also include high-quality protein as well as creatine and carnosine. Creatine helps humans supply energy to all cells in the body, mainly skeletal muscle. Carnosine has a number of antioxidant properties that fight off chemicals that damage the body. They can be found primarily in the brain and muscle tissue. Grass-fed beef and grain-fed beef do have nutritional differences though. In terms of beef nutrition, grass-fed beef has fewer calories than grain-fed beef because grass-fed cows have less total fat. Grass-fed beef may contain slightly less total saturated fat and monounsaturated fat than grain-fed beef, but much more omega-3 fatty acids and conjugated linoleic acid (CLA). In fact, researchers from the Union of Concerned Scientists found that grass-fed steak has about twice as many omega-3 fatty acids as a typical grain-fed steak. Omega-3 fatty acids can help protect the heart and fight off diseases. Grass-fed beef contains about twice as much CLA as grain-fed beef. According to the American Journal of Clinical Nutrition, CLA is associated with reduced body fat and some other beneficial effects. Grass-fed beef has been rumored to have a distinctive taste as well. Even though it is more expensive, people feel that it is worth the price. Daley, C. A., Abbott, A., Doyle, P. S., Nader, G. A., & Larson, S. (2010). A review of fatty acid profiles and antioxidant content in grass-fed and grain-fed beef. Nutrition journal, 9(1), 10. Leheska, J. M., Thompson, L. D., Howe, J. C., Hentges, E., Boyce, J., Brooks, J. C., ... & Miller, M. F. (2008). Effects of conventional and grass-feeding systems on the nutrient composition of beef. Journal of animal science, 86(12), 3575-3585. Ponnampalam, E., Mann, N., & Sinclair, A. (2006). Effect of feeding systems on omega-3 fatty acids, conjugated linoleic acid and trans fatty acids in Australian beef cuts: potential impact on humnan health. Asia Pacific Journal of Clinical Nutrition, 15(1), 21-29. Whigham, L. D., Watras, A. C., & Schoeller, D. A. (2007). Efficacy of conjugated linoleic acid for reducing fat mass: a meta-analysis in humans. The American Journal of Clinical Nutrition, 85(5), 1203-1211. Pastures, G. (2006). How grass-fed beef and milk contribute to healthy eating. Cambridge, MA: Union of Concerned Scientists. McCluskey, J. J., Wahl, T. I., Li, Q., & Wandschneider, P. R. (2005). US grass-fed beef: marketing health benefits. Journal of Food Distribution Research, 36(3), 1. Weber, K., Heinze, K. L., & DeSoucey, M. (2008). Forage for thought: Mobilizing codes in the movement for grass-fed meat and dairy products. Administrative Science Quarterly, 53(3), 529-567. Sitz, B. M., Calkins, C. R., Feuz, D. M., Umberger, W. J., & Eskridge, K. M. (2005). Consumer sensory acceptance and value of domestic, Canadian, and Australian grass-fed beef steaks. Journal of Animal Science, 83(12), 2863-2868. Xue, H., Mainville, D., You, W., & Nayga, R. M. (2010). Consumer preferences and willingness to pay for grass-fed beef: Empirical evidence from in-store experiments. Food Quality and Preference, 21(7), 857-866.